Heat stroke deaths can occur at surprisingly low temperatures, and Texas children are especially vulnerable because we have so many hot days. Heat stroke in children isn’t limited to unattended vehicles. Children can also become extremely overheated when playing outside in hot weather. Infants who are dressed too warmly can suffer from heat stroke. Sunburn and dehydration make children more susceptible to this condition. Heat stroke, or hyperthermia, occurs when the body temperature rises beyond the body’s ability to cool itself down. Symptoms include high temperature but no sweating, flushing, rapid pulse, restlessness, slow or muted response, and can progress to confusion, dizziness, headache, vomiting, rapid breathing, and unconsciousness. Why Are Children So Vulnerable to Heat Stroke? Children get hot faster because their body surface to body weight proportion is higher than that of adults. Because of their higher metabolic rate, children generate more body heat during exercise. Children’s bodies don’t sweat as efficiently as adults’ bodies. Children acclimatize to heat slower than adults. Children don’t experience thirst appropriately. If they are not told to drink frequently, they can suffer from dehydration. Children who suffer from childhood obesity are more at risk because the extra weight compounds most of these problems. How Can Parents Protect Young Children from Heat Stroke? Never – never – leave your child alone in the car, not even for a minute. Child death in a car has occurred as early as February in temperatures in the low 70s. Don’t risk it. Create strategies for yourself so you don’t accidentally forget your sleeping baby in the car. When your cars are parked at home, lock them and keep the keys out of reach of children. If your child goes missing, check your car and the trunk of your car first. If you see a child locked in a car, call 911. Dress children – especially babies – in lightweight, loose clothing. Keep babies inside. When you must go outside, be sure babies are shaded. When riding in the car, make sure the air conditioning keeps your baby cool enough. Slowly acclimate older children to summer heat by allowing them to play outside for short periods of time over two weeks. 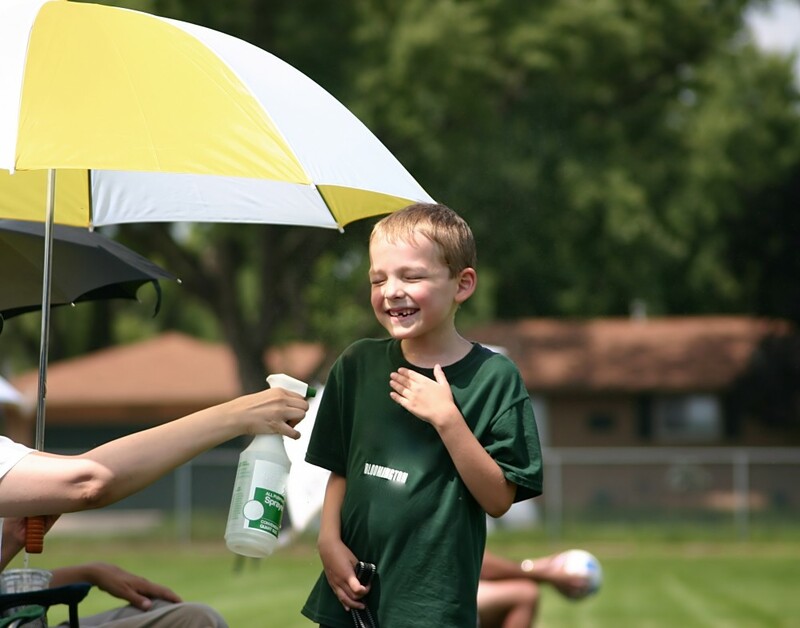 Remind children to drink water at least every 20 minutes during strenuous activity. Remind children to rest and get out of the sun for frequent breaks. What Should Parents Do if Heat Stroke Is Suspected? Heat stroke can be deadly. The moment heat stroke is suspected in children, parents or caregivers should call 911 immediately and follow instructions. You must cool the child as quickly as possible because children suffering from heat stroke can slip into unconsciousness in minutes.